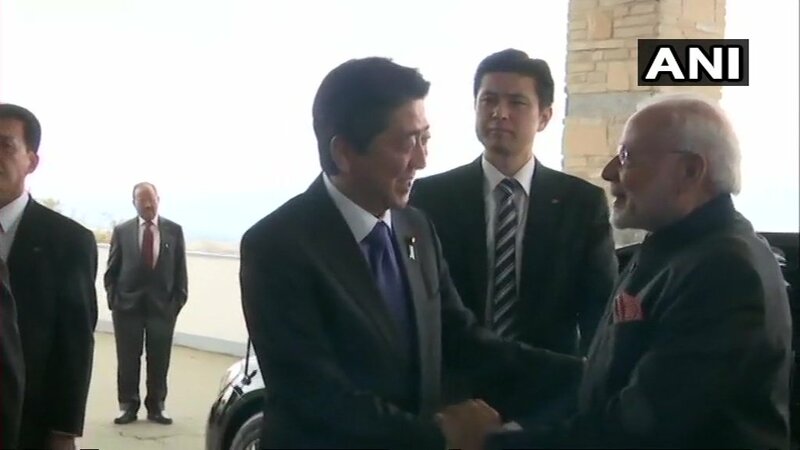 PM Modi and PM Abe held informal talks in a resort near mount Fuji. The two spent 8 hours together on the first day. Modi, reached Japan late evening yesterday to attend the 13th India-Japan annual summit. The two leaders seen cementing their relationship before bilateral talks tomorrow. The two leaders took a stroll in the garden following which Abe hosted a luncheon for Modi at the resort by Mount Fuji.After the lunch, both prime ministers visited the FANUC industrial facility, which specialises in robotics and automation. They both were seen travelling in a high speed train to Tokyo today. Later in the evening PM Abe hosted Modi a dinner at his private villa, facing a lake. “PM Abe also taught me the Japanese way of eating food using chopsticks!” – PM Modi tweeted.